Bonds can lose money, and having too much money in bonds can be a mistake. Owning bond funds isn't exactly the same as owning bonds. Bonds have long been a staple for retirees because of their reputation as a solid way to keep cash secure while also getting some yield from the bond issuer. However, bonds aren't perfect -- or a perfectly safe -- holding for retirees, and they can actually cause you to outlive your savings if you rely on them too heavily. At the same time, bond mutual funds can create more risk than owning individual bonds if you need to sell them at inopportune times. Here's a close look at three facts about bonds that retirees need to know. Factoring these realities into your retirement saving and planning could go a long way toward making sure you have enough money for your entire life. Don't let these facts about bonds catch you off guard. Image source: Getty Images. The first way you could lose money with a bond is if the issuer has financial troubles. For instance, if you own a bond issued by a company that files for bankruptcy, you almost certainly won't get all your money back. The best way to reduce this risk is to buy only government-issued and investment-grade corporate bonds. These issues tend to pay lower yields than so-called "junk" bonds, but if keeping your risk of losses low is a priority -- which it should be for retirees -- then these lower-risk bonds should make up the bulk of your fixed-income investments. The second way you could lose money with a bond is by selling before it matures. This is a very real concern bondholders should consider in the current interest-rate environment, as rates are likely to increase by 75 basis points -- that's 0.75% -- or more per year for the next several years. Here's an example of how that could affect the value of a bond on the secondary market. If interest rates have increased 100 basis points -- that's a 1% increase in the rate -- since a bond you own was issued, and you sell it five years before maturity, you may have to discount it by 5% or more to offset the lower yield versus newly issued bonds. If the bond was worth $10,000, that's a $500 loss by selling early. Not a small amount. What can retirees do to reduce this risk of losses? Buy bonds with maturity dates that align with when you'll need to cash out. This may include a mix of short-term bonds or cash for income within one or two years. You may not capture as much yield from short-term bonds, but you'll reduce your risk of losses thanks to rising rates. For many investors, bond funds are a good way to own bonds. However, every time you sell shares of a bond fund, you're exposed to the same market risk as selling a bond before it matures: interest-rate risk. This means you'll face more risk of losses when interest-rate conditions change, and it can be exacerbated if you invest in the "wrong" type of bond fund for your needs. 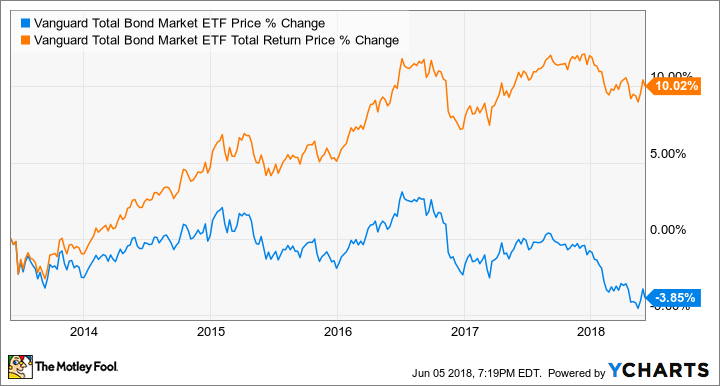 As you can see, the price of this bond fund (blue line) has fallen over the past several years as rates have gone up, while the total return (yellow-orange line), which includes interest paid, is net positive. This is fine if you can hold for more than a couple of years since the interest paid will offset losses in bond value due to rising rates. And less volatility means reduced losses over the short term versus longer-term bond funds. But when interest rates are going up, even a short-term fund won't guarantee no losses. 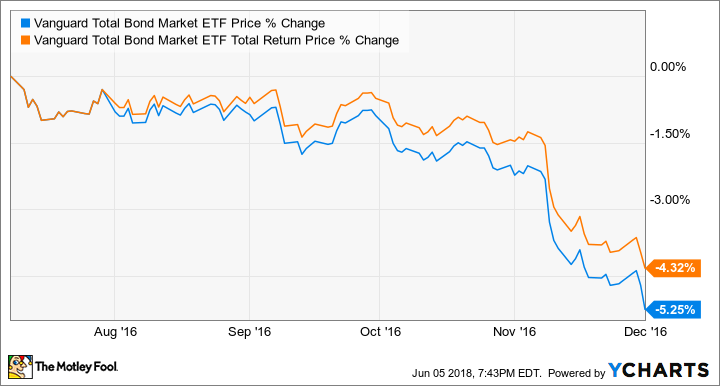 While bonds are less volatile than stocks in the short term, the perception of being "safer" can lead people to rely too much on bonds in retirement. 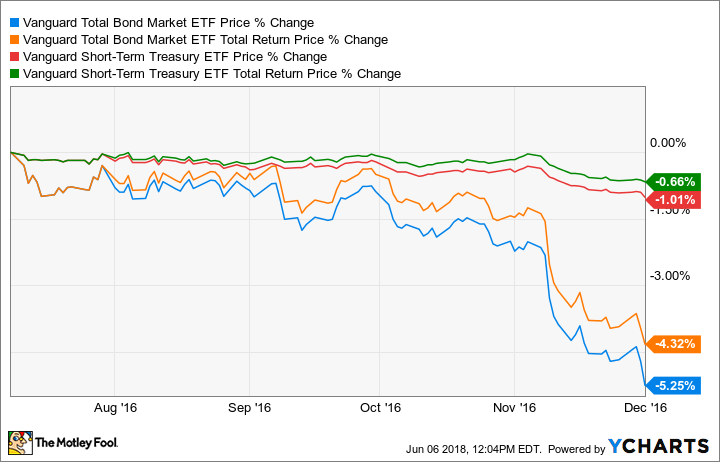 And with bonds offering weak yields in the current interest-rate environment, this can lead to retirees' portfolios generating returns that are too low. And that can mean running out of money while you're still alive. VFIAX Total Return Price data by YCharts. This shows a comparison between the total returns of stocks versus bonds since before the market crash in 2008-2009. 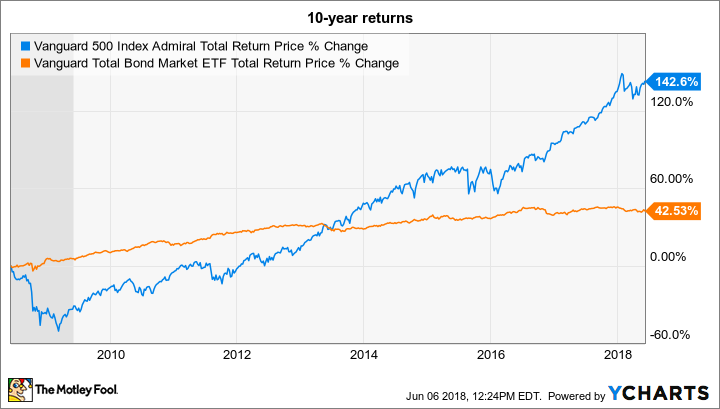 Even through the worst market crash in almost 90 years, a decade-long stock investment has delivered far superior long-term gains. The big takeaway? It's not stocks versus bonds so much as using the proper tool for the job. And since even retirees need to think about their long-term needs, stocks should continue to play a role in your retirement saving.